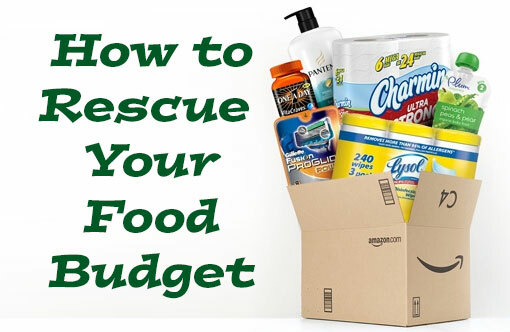 Looking for a quick, cheap and easy way to stock up on pantry items, cleaning supplies, beauty and bathroom products, and other household essentials? Online grocery delivery services are open whenever you're ready to shop, let you skip the traffic and check out line at the store and save you money. Wondering which gives your family the best bang for your buck? Techlicious took a look at the four national grocery delivery services that offer the best prices and selection to find out. 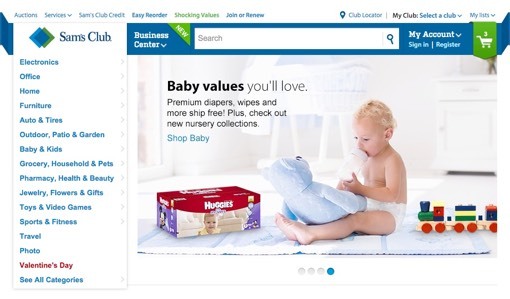 You don't have to visit your local Sam's Club to score their great warehouse deals, but you will need a membership—$45 annually—to shop online. Prices are some of the lowest on our list and Sam’s wide range of items is appealing—you'll just have to decide whether it’s worth the membership fee. 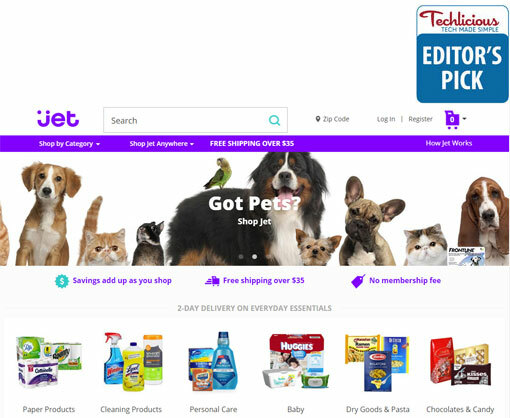 The website doesn't do anything to highlight its grocery section, but you can find what you need by searching—and you can narrow your search by price, brand, and category to find exactly what you're looking for. If you'd like to keep items you use regularly stocked up, you can even subscribe for regular deliveries. Anything you order will arrive within five business days, though shipping costs vary based on your location. Boxed has grocery prices in line with Sam's Club—but Sam's Club requires a subscription while Boxed does not. The downside, however, is a lack of brand selection. While Boxed has a wide range of products—most of them in bulk quantities—it may not have the specific products or brands you're looking for. For example, we searched for Clorox Disinfecting Wipes and found Boxed only had Lysol and Seventh Generation brand disinfecting wipes. If you're considering Boxed, we recommend browsing its product selection to see if it carries the brands you're interested in. 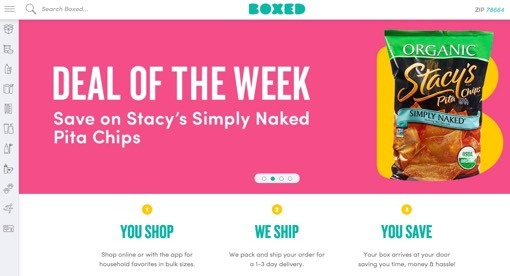 Boxed's website is easy to navigate and shopping is as simple as adding things to your cart and checking out. A $29 minimum order is required, but spending $50 gets you free shipping. All orders are delivered within three business days by FedEx. Due to its high subscription cost—it requires a $99 annual Amazon Prime subscription—it's hard to recommend Prime Pantry on its own. However, if you already subscribe to Prime for its many other perks, you should check out Prime Pantry as a grocery option. Instead of being an ordinary web store where you add items to your cart and then check out, Prime Pantry lets you fill a single box with as many groceries in “everday sizes” as you'd like for a flat $5.99 shipping fee for four business day delivery. This makes Pantry a good option for large orders and bulky items that would otherwise be pricey to ship—but it's probably not the best choice if you're just looking for a few things. Both the selection and prices on Prime Pantry are good, but you don't have access to the full Amazon catalog and prices can differ between Pantry and Amazon's other grocery option, Subscribe and Save. Despite the name, Amazon's other grocery offering, Subscribe and Save, does not require a subscription fee. Instead, you're subscribing to items—a limited, but decent, selection from Amazon's catalog— you want delivered on a regular basis. Subscribe and Save requires a bit more time to set it up initially, but once your items are ordered they'll show up at your doorstep just when you need them. The tricky part of subscribing to items is guessing how often you'll need them. If you're not sure, Amazon offers suggestions when you click to subscribe on something, and that's a good place to start. If that's too frequent or too infrequent, you can change the schedule or cancel an order any time before it ships. Anything you subscribe to gets a 5% discount, but the more you subscribe, the more you save. If you have five or more subscription items in a month, you'll save 15% on your order—and that's where Subscribe and Save becomes a bargain. Items are delivered once a month—you choose the date—and shipping is free, no matter how much you order. While you can buy almost anything from Jet through its retail partners, we're focusing on groceries, which Jet stocks and delivers itself. The item selection offers a pretty good mirror of our local grocery store shelves with a range of national brands. Pricing is reasonable—one of our shopping list items, was lower than any of the other stores we checked—and you don't have to buy things in huge bulk sizes to get those savings. Our only complaint with Jet's website is a somewhat convoluted coupon system: putting “Smart” items in your cart can unlock coupons for other items, which can lead to a bit of a goose chase around the site trying to find the best deals. There's no subscription for Jet—just log on, add things to your shopping cart, and buy them as needed. Shipping is free for orders over $35 and you can expect your groceries on your doorstep within two business days. To put these online grocery shopping sites to the test, Techlicious put together a brief shopping list of some common household items that a typical family might buy. We then compared unit prices across the above sites to see who is offering the best deals. Of all the options on our list, Prime Pantry has the narrowest appeal. It’s good for existing Amazon Prime members looking for goods in everyday sizes. 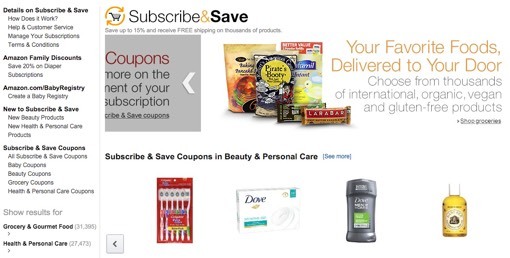 Amazon's Subscribe and Save offering doesn't win outright on price—but if you can organize your monthly grocery needs into subscriptions and buy five items a month, the prices drop by 15%. That puts Subscribe and Save in close competition with the rest of the list, with Clorox Disinfecting Wipes for $0.04 each, Dove Beauty Bar at the lowest price of $0.93 each, and Nature Valley Chewy Protein bars at $0.48 each. Our remaining options are Sam's Club, Boxed, and Jet, which are in close price competition in our product test sampling. Unless you're already a Sam's Club member, shopping there online probably doesn't make sense—and the shipping costs, based on your location, can be high. Jet and Boxed, are our preferences, and of the two, we chose Jet. While Boxed offers some good values, the limited selection and higher shipping costs keep it from being our top pick. Without a subscription fee or shipping fee (for orders over $35), Jet will stretch your grocery budget further. The Dove Body Wash is cheaper via Amazon’s Subscribe & Save because it’s a 4-pack ($1.24 each) whereas Sam’s is a 3-pack ($1.44 each). Sorry for being unclear on the pricing in the chart. For Amazon Subscribe & Save, it’s $19.91 for 4 bottles or $4.98 per bottle. And on Sam’s Club, it’s $12.88 for 3 bottles, or $4.29 per bottle. BTW, this is based on today’s pricing, which is slightly different from yesterday’s, but you get the idea. Indian shoppers can now get updates about grocery offers from http://www.mydala.com/grocery-offers. You can find news and updates about latest grocery offers here. This service could only improve if and when they accept food stamps from the states they deliver to. Then the service will grow by leaps and bounds. I can think of a dozen people who have difficulties getting out to shop because of physical limitations. Plus bad weather, like what is going on outside my door right now, will keep people home bound. I can only hope these folks will wake up and start to do this. Hi David, I just found this article recently and I agree with you. EBT cards should be accepted for these online grocery stores. I am on Social security disability. I use my EBT card at Schwan’s Home Delivery Service. They have an app or you could order through their catalog. Their food is a little pricey, but great for someone who doesn’t want to spend too much time in the kitchen preparing meals. This article missed two good sites for groceries. Thrive and Vitacost, have good quality, many organic products, at better prices than Amazon. Thrive is probably the cheapest, but requires a membership. Vitacost is very good with good service. .jet was just bought by Walmart. I contemplated making a large order thru .jet, but its’ checkout page didn’t follow standard protocols…. no “https”, so I didn’t order from it. I don’t purchase from Walmart because of its’ mistreatment of foreign workers. You made some good points there. This is a really interesting and informative post. Google Express seems to be another affordable option. It delivers other types of items too. I have been a Jet customer for 8 months now. Part of my order never arrived. They are giving me a refund. I don’t have a vehicle and count on businesses like Jet to deliver my food. I may have to shop elsewhere. So frustrating. We use a lot of different online shopping services and mistakes do, occasionally, happen. It sounds like Jet was responsive in giving you a quick refund for the missing portion. If these issues are infrequent, I wouldn’t give up on Jet for this one event. Thanks for your reply, Josh. I am thankful that Jet did start the refund process. They started the refund process on their own. They sent me a message about my order being late. The tracking information shows that my food is still in transit. I will be contacting Jet about that. I want to try Google Express for my dry goods. Their prices are competitive to Jet. I won’t give up on Jet entirely. I live out in the country and Jet is the only business who delivers frozen and refrigerated items without a monthly subscription. I also use Schwan’s Home Delivery Service.